In addition to writing the "Jewish Techs" blog for The NY Jewish Week, I am now writing a monthly technology column for the Detroit Jewish News titled "Jews in the Digital Age". My first column (published this week) looked at how Facebook has affected the high school reunion. Have you noticed a difference (positive or negative) in high school reunions in the past few years as Facebook has grown in popularity? We love to play Jewish geography, know who married whom, and keep up with the latest gossip (uh, I mean news) about our high school classmates. In the pre-Web 2.0 era that meant attending a high school reunion each decade to get reacquainted with everyone’s lives. Today, with just about every human being using Facebook, times have changed. What has Facebook done to the high school reunion? Sharon Landau Levine, 57, of Oak Park attended her 40th high school reunion earlier this summer. The 1971 graduate of Oak Park High School made certain to attend her 10th, 20th and 30th reunions as well, but this summer’s reunion was different. “I think Facebook enhanced this reunion a million times and a lot of my classmates would say the same thing,” she explained. “The planning of the reunion was much easier with Facebook and so was staying connected after the event. The planning committee launched a Facebook page to publicize the reunion and later added a second Facebook page that has become an ongoing discussion group.” In fact, after Levine’s reunion, posts began appearing on the Facebook page announcing regular get-togethers for classmates to catch up in person and for out-of-towners to join in using Skype – the video conferencing application. Jason Klein, 38, of Bloomfield Hills used his Facebook clout to publicize his recent 20th reunion and encourage classmates to register for the event. The 1991 West Bloomfield High School graduate didn’t help in planning his 10th reunion, but when it came time for the 20th reunion Klein stepped forward. Through his company, Medtipster.com in Troy, Klein solicited the help of his web developer to create a website that promoted the reunion and accepted paid registrations. Klein posted weekly updates on his personal Facebook profile and on the reunion’s Facebook page listing the names of classmates who had registered and encouraging other classmates to follow suit. Ken Bertin, 65, of West Bloomfield is no stranger to planning reunions. He’s planned six of them so far and sometimes for two classes at once. While he is quick to acknowledge that his cohort is not the most active demographic on Facebook, he concedes that the social networking site has been helpful in locating “lost” classmates. The Mumford High School alum recently planned a Hampton Junior High reunion too. “Facebook has given me contact with people so I get their email address and I can then contact them without paying for postage,” he said. Bertin estimates that his “35-year-old daughter has 80% of her classmates on Facebook, whereas my class has 25-30%” However, recent studies have shown that the fastest growing demographic on Facebook is the over 60-years-old crowd. One major change Bertin has noticed is that now his classmates are expecting him to post photos from the reunion immediately after the event. “Many people who won’t be able to make the Hampton reunion contacted me asking if I would post photos from the event on Facebook,” he explained. Some people have even felt coerced to join Facebook because there was no other form of communication leading up to their reunion. That was the case for John Kuderik, a CPA in Royal Oak, who was told that if he didn’t join Facebook he wouldn’t know anything about the plans for his reunion. He’s now connected to the classmates he hadn’t seen or heard from in over two decades, and he’s kept updated on their daily activities. But he’s not convinced that’s such a great thing. Brad Feldman, of Farmington Hills, who recently attended his 20th Groves High School reunion, said that Facebook was a much discussed theme at the event. References to photos and other postings became topics of conversation at the reunion, and classmates posted photos from the reunion in the days following. He believes that Facebook activity might have kept some of his classmates, especially the out-of-towners, from attending since they felt they were already sufficiently updated on their classmates’ lives. 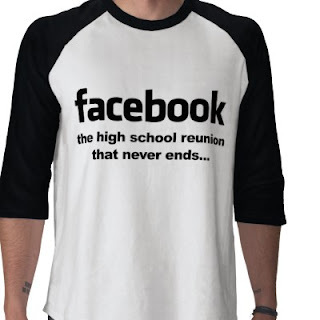 Facebook has had both positive and negative effects on the high school reunion. Some younger people believe that some of the excitement and nostalgia is gone from reunions because of all the reconnecting through social networking sites. Overall, however, Facebook has been helpful to reunion planners as a resource for promoting the event and locating classmates. While Facebook is the killer app of our generation, no social networking website can replace the human interaction of a reunion. The face-to-face reconnections are the best form of social networking that exists. Rabbi Jason Miller (@rabbijason) is a tech expert who writes about how information technology and social media are transforming the Jewish community. He writes the “Jewish Techs” blog for The NY Jewish Week and is president of Access Computer Technology (www.accesscomptech.com), based in West Bloomfield. The new technology column will no doubt be a positive addition to the newly constituted Detroit Jew News. B'Hatzlaha!! I can relate to you post. Facebook did help former students and schoolmates reunite and socialize once again. I've just attended 4 reunions for this year alone and it was so much fun! I'm looking forward to read more of your Jews in the Digital Age articles Rabbi Jason. Can you please send me the link? Shalom! I just posted this blog onto my blog as a follow up of sorts to something a wrote about last month regarding social media and nostalgia. I hope you don't mind.